Hillsdale Furniture of Louisville, Ky., is recalling about 500 Polston and Collin bar stools. The stool seat can loosen or break off at the base, posing a fall hazard. This recall involves Polston and Collin models of swivel backless bar stools. 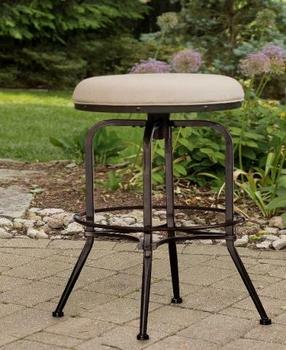 The Polston bar stools have a tan seat cushion and metal base with four legs and were sold in a mocha color. They were sold in two sizes: counter height at 26 inches tall and bar height at 30 inches tall. The Collin bar stools have a wooden seat and metal base with four legs and were sold in two colors: mocha and white. They were sold in bar height at 30 inches tall. The model number is printed on the packaging and in the assembly instructions. The bar stools, manufactured in China, were sold at Bellacor, Bob’s Discount Furniture, Platte Furniture Mart, Rooms to Go, Alladin, Lamps Plus stores nationwide and online at 123stores.com, Overstock.com, bedbathandbeyond.com, Hayneedle.com, PurchasingPower.com Wayfair.com, and Zulily.com between March 2017, and December 2017, for between $85 and $115. Consumers may contact Hillsdale Furniture at 800-368-0999 from 9 a.m. to 5 p.m. (ET) Monday through Friday or online at www.hillsdalefurniture.com and click on “Product Recalls” at the bottom of the page for more information.